We’d love your help. Let us know what’s wrong with this preview of The Tall Man by Phoebe Locke. To ask other readers questions about The Tall Man, please sign up. "The legend of the Tall Man can be traced back as early as the 1970s. An urban legend which began circulating around schools in England, it has several variants – the most popular is that of a man who murdered his disobedient daughters. This version of the Tall Man can be sought out by ‘good’ or ‘special’ girls – the legend goes that girls who offer presents and subservience will be rewarded with gifts of their own. In some versions of the story, these gifts are powers, while in others, they ar "The legend of the Tall Man can be traced back as early as the 1970s. An urban legend which began circulating around schools in England, it has several variants – the most popular is that of a man who murdered his disobedient daughters. This version of the Tall Man can be sought out by ‘good’ or ‘special’ girls – the legend goes that girls who offer presents and subservience will be rewarded with gifts of their own. In some versions of the story, these gifts are powers, while in others, they are guardians – often said to be ‘sent from the shadows’." I loved this!!! I bought this book back in June and decided that since it's October it will be perfect for a creepy read and was I right. So. Much. Fun. Earlier this year I read a book with a very similar story line, Mister Tenders Girl, and I have to say that I enjoyed this one much, much more. I won't even begin to dissect the plot because there is a lot going on here and I would hate to spoil anything. Go in blind and enjoy! "I can make you special, if you ask." WOW I didn’t just like this book I loved it and devoured it practically in one sitting!! Glad I read this in the day as it is spine tingling creepy!!! Definitely not a book that is easy to forget, the Tall Man comes and steals daughters, is he an urban myth or is he real? Told over several timelines, we are introduced to Sadie, Amber and Miles. Sadie makes a decision after Amber is born and that decision will change the course of all their lives. All I can say is read this book, the tall man makes WOW I didn’t just like this book I loved it and devoured it practically in one sitting!! Glad I read this in the day as it is spine tingling creepy!!! All I can say is read this book, the tall man makes the boogey man seem like Father Christmas!!! The tall man lives in the woods. He sees everything. He comes in the night and he takes you away. He is a murderer. He has killed his own daughter. She didn’t do what he wanted. He can make you special if you ask him. The story is about Miles, Sadie and their daughter Amber and about a decision Sadie makes years before that turns her life upside down and changes the course of her life. The Tall Man by Phoebe Locke is a very creepy thriller about several members of the Banner family. Sadie believes she is being haunted by the Tall Man and that he is going to harm her daughter. This book was scary and creepy in parts and I found it rather confusing because it jumped about in time too much for me. I would like to thank NetGalley and Headline for my e-copy in exchange for an honest review. This was one of those titles where the synopsis just grabs you! I loved the sinister undertones that the blurb delivers. The title reminded me of the slender man internet meme and turned out to be just as creepy! I love an unsettling story and this lived up to my expectations. It quickly shot to the top of my to-be-read pile and when it was over I was sad that it wasn't going to be continued as a series. THE TALL MAN is addictive and unforgettable. The development of the characters was brilliant, This was one of those titles where the synopsis just grabs you! I loved the sinister undertones that the blurb delivers. The title reminded me of the slender man internet meme and turned out to be just as creepy! I love an unsettling story and this lived up to my expectations. It quickly shot to the top of my to-be-read pile and when it was over I was sad that it wasn't going to be continued as a series. THE TALL MAN is addictive and unforgettable. The development of the characters was brilliant, this is more of a slow-burning read that builds up the layers resulting in a truly spine-chilling ride. Locke skirts the periphery of the horror genre with this one. Those books that are as much horror as they are thriller seem to be really catching my imagination of late. The timeline does change throughout the book which can be a little confusing until you get used to the style and layout. I feel that this is a fairly unique psychological thriller that will easily captivate lovers of the genre. A taut read that is narrated by several different people. The ending was a pretty explosive moment, I loved it! I managed to read this one in a day, I just adore it when a book gets into your head. It is definitely not a bedtime read! I hope Locke writes in this same vein in the future, I would definitely be up for trying another of her books. This is the second thriller this year (that I know of) to be clearly inspired by the Slender Man case. (The first being Mister Tender's Girl, which I didn't finish.) It centres on Sadie Banner, who, as a child, is introduced to the legend of a sinister figure known as 'the Tall Man' by a group of older girls. Justine, the ringleader, explains that the Tall Man can make his acolytes 'special' if they prove their devotion to him – but he also 'takes daughters'. While it's unclear whether this evil This is the second thriller this year (that I know of) to be clearly inspired by the Slender Man case. (The first being Mister Tender's Girl, which I didn't finish.) It centres on Sadie Banner, who, as a child, is introduced to the legend of a sinister figure known as 'the Tall Man' by a group of older girls. Justine, the ringleader, explains that the Tall Man can make his acolytes 'special' if they prove their devotion to him – but he also 'takes daughters'. While it's unclear whether this evil figure is real or Sadie is suffering from a delusion, she carries her belief in the Tall Man into adulthood. So when, as a student, she unexpectedly gets pregnant and decides to keep the baby, Sadie believes the safest thing to do is abandon her daughter, lead the Tall Man away. Flash forward to the present day: Sadie's daughter Amber is now a teenager. We learn very early that Amber has stood trial for murder – though she was found not guilty – and, trading on the resulting media notoriety, has become a sort of celebrity. I know the above sounds like I'm giving a lot away about what happens in the story, but thanks to an intricate structure of interlocking narratives, pretty much all of it is disclosed in the first couple of chapters. Locke does a good job of juggling a plethora of voices and perspectives throughout. First, there's the story of Sadie and Miles, Amber's father, and later, Amber herself. This strand stretches from 1999, when Sadie and Miles meet, to 2016, the year of Amber's crime. In 2018, we meet Greta, assistant director on a documentary film about the Banner family, as she follows Amber on a media tour of the USA. Then there are flashbacks to Sadie's childhood, in which we see how she falls under the spell of the Tall Man. Later, extracts from the diary of another character – the mother of one of Amber's friends – are also added to the mix. There's a lot going on, and it's to the author's credit that these multiple entangled threads don't become confusing. The plot offers up many points of intrigue to maintain the tension and pace. How is Amber's crime linked to Sadie? Who was Amber's victim? Is the Tall Man real? As someone who loves horror, I was disappointed that the book didn't lean into this last question as hard as it could have. The shadow of the Tall Man is, I think, mostly a unique selling point to make this particular thriller stand out in a crowded market. While Locke handles the supernatural element with impressive subtlety, she never really delves into the potential it offers. As a result, there's something lacking here. Something a bit... soulless, perhaps. The idea is great, and it’s difficult to put a finger on anything specifically wrong with the writing; it just feels, when you come to the end, like an empty shell of a story. Which sounds much harsher than I mean it to – The Tall Man is certainly enjoyable, and sometimes that’s all you need. It just might not stick in the memory for long. I am on a roll this week with reading and reviewing! I can't believe I have managed one book a day. There have been some really GREAT ones, some TERRIBLE ones, and some that fall between. This particular one fall in the "in between" category. I liked this book. I liked the authors execution and the mystery behind "The Tall Man" and how she manages to bring her readers to the edge of their seats. However, I felt that much of the book was SLOW. There were moments where I wondered where the heck the book was going and if we were ever going to get there. I think the authors intention was to slowly build the reader up until the brutal end BUT it was much to slow for me. Had there been more exciting parts I think I would have liked it better. On top of this, I read a similar book that surrounds the Tall Man urban legend at the beginning of the year and this one felt a bit to close to it in terms of how the story is written about it. I would have LOVED for this book to be about a particular part (view spoiler)[when the three teens kill the child FOR their supposed Tall Man (hide spoiler)] rather than an after story, but it worked fine for what she was trying to convey. Perhaps someone in the future will solely base their book on The Tall Man and NOT it's aftermath? We shall see. But if they do, I am HOPING it was be extremely creepy! Sadie leaves her infant daughter behind, years later that infant daughter is on trial for murder – but whose murder and why? Phoebe Locke weaves an intimately fly on the wall style tale, using flashback and current time to excellent effect – slowly the story emerges of a shadowy figure haunting lives – but how much of it is in the eye of the beholder and how much of it may be real. Well that is the question that hovers over this entire cast of very intriguing characters and one that might just haunt your dreams a little later on. I like the documentary elements, it allowed for outside view, the author puts lots of clever little nuances into the narrative, tapping into the urban legend vibe and keeping things off kilter. It is beautifully absorbing one of those books you just live within – the ending was surprising and unpredictable, which of course I loved, Phoebe Locke manages to leave you with some thought provoking tangles – astutely done. Overall a really excellent, highly addictive read. Definitely one to watch. Would make an incredible tv drama and The Tall Man is not going to leave me alone anytime soon. Damn him! The story mainly alternates between 2016 when Amber Banner was 16 years old and in 2018, when at 18 she is taking part in a documentary following her acquittal of murder. Who was the victim and why. All sorts of scenarios rang through my mind with my list of possible victims constantly changing. Amber was just a baby when her mother Sadie left, leaving her husband Miles to bring Amber up alone. Convinced that she was being followed by the Tall Man, she maintains she left for Amber’s safety. Her r The story mainly alternates between 2016 when Amber Banner was 16 years old and in 2018, when at 18 she is taking part in a documentary following her acquittal of murder. Who was the victim and why. All sorts of scenarios rang through my mind with my list of possible victims constantly changing. Amber was just a baby when her mother Sadie left, leaving her husband Miles to bring Amber up alone. Convinced that she was being followed by the Tall Man, she maintains she left for Amber’s safety. Her return nearly 16 years later changed the family dynamics – it wasn’t easy for anyone, Sadie especially, as she had to fit in to a family unit already formed without her. This was a slower paced read which at first I found confusing. Was the Tall Man real or the product of a delusional and unbalanced mind. As the story progresses however, the tension racks up and by the end I didn’t have any fingernails left. Amber was not an easy person to like, especially the 18 year old one. She comes across as being self obsessed and manipulative. She’s very aware of her worth to the media following the trail and treats the project like her own reality show, running the film crew ragged with her demands. However for all her diva’ish behaviour, there are glimpses of a vulnerable and troubled young woman still suffering from past events. On the other hand, the way that these programmes are made is an eye opener when executives and producers cross boundaries – they will do anything to make the programme a ratings smash – even if that is to the detriment of the subject being filmed. Emails and diary extracts give an intriguing insight into the background leading up to the trial. My overriding feeling about this book is how unsettling it is. Was the tall man story just an urban myth bought into by impressionable schoolgirls, or was there something more sinister at its heart. It made me think back to my very early childhood when I was told never to go alone in the woods at the end of our road as a bad man lived there who took children. My parents were either being extremely safety conscious or very cruel! The Tall Man is an extremely clever and chilling debut. The supernatural element adds to the darkness of the story and the uncertainty and suspense that surrounds the tale of the tall man are very well done indeed. I really enjoyed this book, it kept me guessing until the very end as crucial clues were dropped in as the chapters passed. The story alternates between multiple timelines, which was borderline confusing and definitely frustrating at times because the perspectives would change just as you were being drawn in (which I guess was entirely the point!). This is one of those reviews where giving away the plot would be a cardinal sin, so I’m trying to be careful… the timelines cover the Sadie’s childhood, her present in 2016 and then in 2018 a TV documentary crew are interviewing Amber, Sadie’s daughter about events that took place back in 2016. Eventually all the lines converge and you get a full picture of the events leading to the TV documentary and also how all of the characters relate to one another. I loved the characters in this book, very few of them are how they appear to be on first impressions and it’s very satisfying to read their development and motives. Character driven plots are always my favourites and the author has mastered the art of characterisation! I think Greta the documentary interviewer was my favourite character, she had the most objective view of the events but as a naturally compassionate human being she had her own unique take on everything that her colleagues didn’t share. This is written in as a statement of fact, it doesn’t make her any more right or naïve than anyone else which is refreshing. The Tall Man himself as a concept is very much like Slenderman – you have to figure out for yourself throughout the book whether he’s real or not, or if it even matters. Another thing that she excels at is the building of tension and knowing exactly when to drop the next clue, each clue opens up a whole new dimension to the story that the author then writes about in full from different perspectives before dropping the next one – I was one happy thriller reader when the book came to a close! The Tall Man is a fabulous book! As a big fan of paranormal thrillers did I love how the legend of the Tall Man made the basis for this book. How all three storylines in different ways had to deal with the Tall Man. But, the Tall Man is just a legend isn't he? Something to scare the little children with, he can't be real, can he? Now, I don't say that this is a paranormal thriller, nor do I say that it isn't. It's all how the reader will perceive the story. And, in that lies the greatness of the The Tall Man is a fabulous book! As a big fan of paranormal thrillers did I love how the legend of the Tall Man made the basis for this book. How all three storylines in different ways had to deal with the Tall Man. But, the Tall Man is just a legend isn't he? Something to scare the little children with, he can't be real, can he? Now, I don't say that this is a paranormal thriller, nor do I say that it isn't. It's all how the reader will perceive the story. And, in that lies the greatness of the book. It's all about how you interpret the story. I would say that perhaps there is a thing like the Tall Man, or perhaps not. Some parts really make one believe that while you still rationally try to explain it all. What I love about the book is that the truth about what happened in the present story in the 2018s took is time to be revealed. Deliciously slowly one could say, just the way I like it and then BAM the truth is out, and its connection to the past. The last couple of chapters are so good. And, yes I'm being very vague, but honestly, this is a book that you should read with so little beforehand knowledge as possible. That's actually my attitude towards all thrillers. Much more fun to know as little as possible. So, I will say this, the writing is terrific, the story is great and I can't wait to read Phoebe Locke's next book! Also, you must definitely the book if you are a (paranormal) thriller fan! The Tall Man is a slow-burner of a thriller that packs quite the punch. For the longest time, I couldn’t at all get a handle on things, wasn’t quite sure what to make of it and felt a little confused. Yet I was constantly intrigued enou Have you met the Tall Man? Be afraid. Be very afraid! Like many people, I'm well-versed with the urban legend of the Slender Man; not to mention the real-life horrors that followed the birth of the myth. It's easy to see how writers would be inspired by such a dark, eerie notion - and this novel showcases just how influential these types of legends can be. I was expecting some sort I received a copy of this book from Netgalley, in exchange for an honest review. I was expecting some sort of faithful representation of the Slender Man; a horror perhaps, or at the least a very dark thriller. However, it went against my expectations in many regards, and mainly in a good way. The story, which flits to the present and the past, focuses on Amber; a girl that we find out early on is a murderer, cleared publicly of her crime, and now something of a celebrity. As the tale progresses, we find out more about her mother, Sadie - a haunted woman convinced that her daughter is cursed; so much so that she's willing to walk out on her for years to save her. Miles, Amber's father, seems a decent enough sort, though it becomes apparent that he's got secrets too. Greta, who is attempting to interview Amber for a documentary, can see vulnerability in her - something that her colleague Tom thinks is ridiculous. The question is - which version of Amber is the real one? The scarred teenage girl who's been through hell and come out the other side? Or a monster in a young woman's clothing? For the first hundred pages or so of this book, it felt much like many other supernatural thrillers I'd read. The 'Tall Man' remained vague, the suspense was slowly being built, and I felt myself thinking that it was a solid 4-stars - entertaining, gripping, but not much different to other books in this genre. Then all of a sudden, things really picked up. I loved the ambiguity of it all - the continual flip-flopping between 'oh yes this is definitely some evil supernatural forces at work' and 'it's all in their heads'. Even at the end, which had a firm conclusion, there was still a tiny question-mark of doubt, which I thought was clever. I also didn't see the ending coming. In addition to the major twist, there were a few minor ones that completely took me by surprise, which is always very satisfying in books like this. The only minor quibble I'd level at it is the portrayal of the 'Tall Man' himself. I accept the author was trying to keep him as a shadowy threat and nothing more, but he felt a little too insubstantial at times, and thus not quite as menacing as he could have been. The spooky little girl companion was far more convincing. I liked the idea but for the most part this didn't work for me. I found the idea of this book really appealing. The Tall Man is somewhere between a myth, a legend and fantasy - a story to scare children with maybe - or is it? "He killed his own daughter because she didn't do what he wanted". "He can make you special". The scene is set in two eras. A current era note on a documentary about the Banner family in 2019. Then, in italics, a story about young girls being told about The Tall Man I liked the idea but for the most part this didn't work for me. I found the idea of this book really appealing. The Tall Man is somewhere between a myth, a legend and fantasy - a story to scare children with maybe - or is it? "He killed his own daughter because she didn't do what he wanted". "He can make you special". The scene is set in two eras. A current era note on a documentary about the Banner family in 2019. Then, in italics, a story about young girls being told about The Tall Man by older friends - this part is certainly a little spooky. This is in an earlier time to any other part of the story and is indicated by the use of italics in the main stories. The story then runs in three time periods in addition to the earlier "italic" story. In 1999 we see Sadie, Miles and a baby about to be born who will be Amber. In 2016 we see Miles, Amber and a now returned Sadie who has been away from the family for a long time. In 2018 we see Amber after her trial for murder being filmed for the documentary. The only person who clearly appears in all time periods is Sadie who is one of the girls in the woods being told about the Tall Man. This is obviously a gradual reveal type of story where we will find the threads connecting as the book goes on. This is one of my problems with this book. There is a reveal to come about Amber's murder case and one about Sadie's absence however that information was disclosed far too slowly for me. While quite spooky as a read at times, I did find it quite hard to get a handle on the early parts of narrative too. I found the sections relating mainly to Amber - the 2018 ones - didn't really hold me at all until the end. We know Amber has committed murder from quite early on but I didn't feel I was being fed enough of the story. Equally I found her a hard character to engage with in any way. In fairness she was not the only character I felt that about. Until I was around 70% through this, I felt it lacked pace and was a disjointed read for me. I found it awkward to follow at times and didn't get any feeling of depth from any of the characters. From then on it did get more interesting and I probably would not have stopped reading it. However even the end left me fairly indifferent. I'm sure many people will enjoy this tale and get more out of it than I did. Este livro tinha todos os ingredientes para ser um thriller excelente: contado em três tempos diferentes, conta uma história arrepiante com um personagem sinistro, o tall man. De alguma forma todos estes tempos e estas histórias se irão interligar, devendo ter originado um thriller perturbador. No entanto, na minha opinião, a escrita de Phoebe Locke não resultou. Ok, so if you really don't want to sleep tonight, then read this! If you love Stephen King, Halloween, listening to urban myths and truly spine tingling reads, then this is your book! Phoebe Locke's thriller deserves all the hype - it really is a book that will having you switching on the lights, shivering under your bed covers and making you scared of the shadows! The Tall Man starts in 1990 where we watch three girls gathering in the woods and devoting themselves to a sinister figure. Then we Ok, so if you really don't want to sleep tonight, then read this! If you love Stephen King, Halloween, listening to urban myths and truly spine tingling reads, then this is your book! Phoebe Locke's thriller deserves all the hype - it really is a book that will having you switching on the lights, shivering under your bed covers and making you scared of the shadows! The Tall Man starts in 1990 where we watch three girls gathering in the woods and devoting themselves to a sinister figure. Then we leap to the year 2000, where a young mother has disappeared, leaving behind her husband and a baby daughter. Moving forward again, we are taken to the present day, 2018, and pick up the story of a teenage girl who has been charged with murder and faces a trial that will shock the world. How are these lives connected? Who is the Tall Man who casts a shadow over these girls and what is his power over them? This has all the ingredients for a perfect thriller. Firstly there are three timelines which alternate, revealing the different characters and segments of the story. These three story lines are used to build tension, suspense and fear, and expertly managed so slowly the truth is carefully revealed. The structure of the novel is very effectively controlled and executed, showing Locke's confidence and skill as she knows exactly how to hook the reader, keep them captivated and maintain the level of tension throughout the entire novel. The atmosphere is dark, oppressive and deeply creepy. It's fantastic to read a novel that blurs genres and makes the reader question what is real and what is imagined. The use of storytelling and urban legends, particularly in the scenes between the teenage girls, is such a great hook and one that immediately sets the reader on edge. Locke's depiction of teenager girls, their dialogue, behaviour, motive and attitudes is utterly convincing and authentic. In fact, all the characterisation is completely realistic, even with the controversial narrative of the mother who has abandoned her baby and husband. Locke is able to make you relate to each of the key characters, to engage with them and to want to stay with them as they journey through trying to confront their past, their present and their future. She has a great insight to the characters emotional states of mind, their dilemmas, decisions, anguish and fear which helps the reader to relate to them fully. It adds depth to the atmosphere of menace and threat that lurks in the situations they find themselves facing. This is one hell of a creepy story that compelled me to just open my eyes one more time before I went to sleep because it just unsettled my mind in so many ways, taking me back to childhood days and dark shadows in my bedroom, that seemed to move when only I was there. The Tall Man is an Urbane legend that comes for your daughters but that is all I can tell you to find out what he does and says you need to read the book. The story is told through various time lines from childhood through to anoth This is one hell of a creepy story that compelled me to just open my eyes one more time before I went to sleep because it just unsettled my mind in so many ways, taking me back to childhood days and dark shadows in my bedroom, that seemed to move when only I was there. The Tall Man is an Urbane legend that comes for your daughters but that is all I can tell you to find out what he does and says you need to read the book. The story is told through various time lines from childhood through to another generation. Sadie is the main character whose life has been moulded round events that occurred because of the Tall Man. But it is for you the reader to decide if everything is real in this devastatingly eerie story. Set in two closer time lines is then the story of Amber and a TV crew that want her story and seem to be prepared to do almost anything to please this unlikable diva of a young woman, in order to get the facts. After all it isn’t every day that someone’s conviction is overturned for murder, but you will have to wait to find out of who and why. The story really gets under your skin to the point you don’t know if the Tall Man is real or the frenzied minds of the time. Either way if it feels real then it doesn’t take a lot to push you over the edge. Some fears never go away and for Sadie, even as an adult, the fear is still as strong. How can you escape the thing that knows all the dark places to hide, including those in your mind? The novel opens with an internet/media based theme. ‘Making the movie – Banner family’ is an upcoming documentary in July 2018. The Banner family is tied to a senseless murder, personal demons and an urban legend. Sounds great! The timeline within the novel jumps around various era’s. It is tough at first to fathom it all within your mind. But eventually it slots into place. 1999 – See’s the marriage of Miles and Sadie, with Sadie expecting her first baby. But Sadie is fearful, of the future. 200 The novel opens with an internet/media based theme. ‘Making the movie – Banner family’ is an upcoming documentary in July 2018. The Banner family is tied to a senseless murder, personal demons and an urban legend. Sounds great! 2000 – will see the birth of the couple’s young daughter Amber. Only 3 days after her birth, Sadie will disappear claiming ‘They’ll come for her’ and the baby is cursed. 2018 – follows 18yr old Amber Banner as the TV crew prepare to make a series of interviews for a documentary about her family. The novel then jumps back and forth between the various era’s establishing the curse of the Tall Man. The depiction of Sadie’s possible post-natal psychosis was brilliant, and you really got a sense of the mother’s internal horror with herself and her new baby. The detail about the 1970’s urban legend the Tall Man, stalking women and their daughters had so much potential. But for me, it failed to cross over to the truly horrifying. I also found the novel repetitive throughout, which added more frustration than terror. The description of this book on Netgalley really had me requesting it right away. It was so intriguing and I was so excited to read it. It started great and even at early pages, I have the idea on how the characters and the events will relate to each other in the end. And Thank God I did because it would've been very confusing as the story jumped from time to time. 3 timelines in all. And I enjoyed it. I actually found the writing style genius. I really liked the concept of The Tall Man, like the description, it was all so intriguing and I had no choice but to keep reading. For me, this one is a great mystery novel. Even the characters are amazing. I don't think I have a complain about any of them. So why the I rated it only 3.5? As I said it was all mystery, when the mystery unfolds, it was a little underwhelming. Seriously the build-up of suspense was incredible but in the end, I felt like, everything build up for something less. It's not really disappointing, it's just fine but it didn't reach my expectation. Will I recommend this? Of course. I enjoyed reading The Tall Man and I'm looking forward to more from this author. Fiquei bastante desiludida com este livro. Houve tanta publicidade e comentários positivos que acabei por criar esperanças que não foram correspondidas. Estava à espera de um livro assustador que me arrebatasse mas o livro que li não era nada disso e estive mesmo para desistir a meio. Houve alturas que fiquei à nora, sem perceber nada. Só mesmo no fim é que tudo fez sentido e foi a única parte que gostei deste livro. Se não fosse o final não sabia quantos estrelas haveria de dar. When Sadie was a little girl, she and her friends wanted to be special. The Tall Man could make them so, they thought -- he gives gifts to his special ones, and others he takes away. But sometimes he needs help. When Sadie was a woman, she had a daughter, and for a while the whispers from the darkness retreated. But the Tall Man comes for daughters, and she knew she had to lead him away from Amber. Now Amber is a young woman, and the centre of macabre celebrity after walking away innocent from a When Sadie was a little girl, she and her friends wanted to be special. The Tall Man could make them so, they thought -- he gives gifts to his special ones, and others he takes away. But sometimes he needs help. When Sadie was a woman, she had a daughter, and for a while the whispers from the darkness retreated. But the Tall Man comes for daughters, and she knew she had to lead him away from Amber. Now Amber is a young woman, and the centre of macabre celebrity after walking away innocent from a murder trial, the images of her bloody hands and clothes still fresh in everyone’s eyes. But who did she kill, and why, and did the Tall Man really make her do it? The Tall Man is a creepy, tense story of psychological suspense and impending horror. It's gripping - I couldn't put it down and read until the early hours, immersed in Phoebe Locke's atmosphere and addictive writing. It's hard to believe this is her debut, because the plot and characters are really well crafted. Firstly, I thought the mix of the possible 'supernatural' with the story's doubt around which characters are trust-worthy, made this novel have a satisfyingly jumpy feel. I was so intrigued as to whether this legend is all a figment of over-imaginative young minds, or whether there's some truth in it... it's the kind of eerie tale passed from generation to generation which should have you thinking twice about offering anything up to a mysterious man who can 'make you special'...! The various narratives, showing different timeframes as well as some characters at different points in their lives, provides some great surprises and things I didn't see coming, and they had me excited to try and work out how they would link together - if at all. Why did Sadie abandon her daughter and go missing for all those years? Why was Amber on trial for murder - and did she really do whatever she was supposed to have done, despite getting off the charges? I love that feeling, when reading a book, of trying to second-guess how it all might fit together - and (for me) then usually getting it wrong, but I always enjoy the process anyway! The modern-day story was strange in many ways, as it provides quite a different feel - you're suddeny back with the documentary crew trying to make a film about Amber, and you see her as she's grown up and wonder exactly what happened. This part of the story, because it focuses on people outside of the family and Sadie's friends (ie. documentary maker Greta and the crew she works with), feels more 'normal' than the other parts, but there's still that strong sense of mystery and the unknown. I also liked this narrative as it feels like the part where we as the reader is going to get the most answers! I don't want to give too much away about this novel so I'll stop this review here, but if you're looking for an original thriller/ mystery/ horror that is quite likely to leave your mind on edge, I'd definitely recommend this. Above all, it's a really fun, well-crafted read that makes you want to keep turning those pages, whatever the time, right until the end! I have to admit to being fascinated by recent media coverage of The Slender Man urbane legend and the real life case surrounding it that shocked the world. So it was with that in mind that I went into The Tall Man rather nervous about how Phoebe Locke would use a similar urbane myth to connect the events in the blurb. And what a brilliant mystery she has crafted! It’s creepy, unpredictable and suspenseful with such an addictive storyline that I didn’t want to put it down-mainly because it scared I have to admit to being fascinated by recent media coverage of The Slender Man urbane legend and the real life case surrounding it that shocked the world. So it was with that in mind that I went into The Tall Man rather nervous about how Phoebe Locke would use a similar urbane myth to connect the events in the blurb. And what a brilliant mystery she has crafted! It’s creepy, unpredictable and suspenseful with such an addictive storyline that I didn’t want to put it down-mainly because it scared the **** out of me and I wanted to make sense of the direction of the narrative by following it through to the end as quickly as I possibly could! What could possibly connect the events of the three timelines that are weaved together here? The legend of the Tall Man that spooks a group of young schoolgirls, a mother walking out on her young baby and a young woman who has recently been tried for murder? As documentary makers start on a fly on the wall “shockumentary” about a teenage girl, the flashbacks throw shadows onto their investigation of her life darkening the background to her story. Throughout most of The Tall Man, I was never really too sure about the exact genre of the book. Was it a supernatural horror or a psychological thriller? What was real and what was imagined? But like all urbane legends, sometimes the truth is more shocking than you could ever imagine. Phoebe Locke had me in her powerful grasp from the very start of this utterly terrifying tale. I had to read it in the daylight hours though as, like all good creepy commentaries, the legend of The Tall Man felt very real and I wasn’t taking any chances! I loved the fact that I didn’t have a clue as to where this one was heading and as those last few pages had me completely enthralled, I forgot to hide behind my cushion when the tension cranked itself up to levels much higher than I had been expecting. This book promises a high quality storyline with its intriguing premise and I have to say that it really delivers and the execution is spot on! Really recommend this one! I loved the idea of this but it just felt very flat. The twist didn’t really feel like one and I wasn’t invested in any of the characters. The 1.5 stars are for the last 10% of the book. Mucha paja y pocas sorpresas. 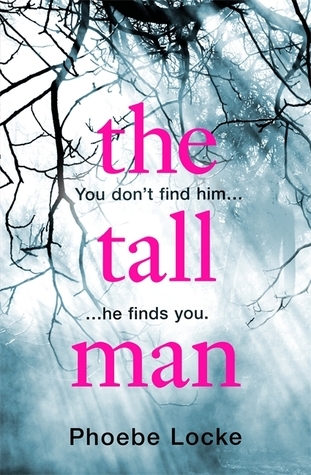 The Tall Man has been marketed as a chilling thriller - but unfortunately for me I think I am in the minority here because I didn't find The Tall Man chilling or frightening but that's probably me and not the book. The story follows Amber Banner a young girl who has been acquitted of a murder charge and now finds herself thrust into the media spot light and filmed by a documentary crew whilst she is on a media tour in The States. With flashback chapters from 2 years prior leading up to the murder The Tall Man has been marketed as a chilling thriller - but unfortunately for me I think I am in the minority here because I didn't find The Tall Man chilling or frightening but that's probably me and not the book. With flashback chapters from 2 years prior leading up to the murder and her mother Sadie's story who abandoned Amber whilst she was only a few weeks old and returns when she is 16 The Tall Man has 3 different timelines, many characters and can, in places, be confusing. Having read other reviews, I am sure the majority of readers will find this scary, chilling and gripping, but unfortunately it didn't work for me.